This was a well-known Monroe landmark. 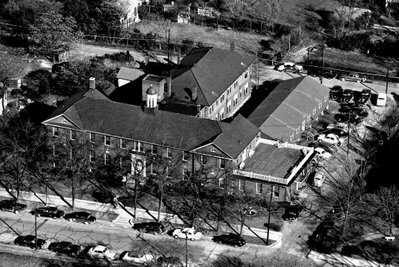 Marizell has properly identified this aerial photograph as the Ellen Fitzgerald Memorial Hospital. Click on "comments" under this post for more details. Yes, there are more levels (1 thru 5). The building is the Ellen Fitzgeral Hospital on Hayne Street, diagonally across from the 'new' First Baptist Church. My Aunt Zell Eckert was director of Nurses there for several years. It was at a dance at the hospital that my mother met my dad. Mother was a nurse there back in the 1930's. Most excellent level ONE aerial skills, Marizell. Your comments are certainly a welcome addition and add another dimension to the picture. I'll wait a few days for other comments before we move on to Level TWO skills. Remember these levels get progressively tougher as we move forward. I'm assuming lots of you, like me, were born in the Ellen Fitzgerald. I'm assuming it is still there. Isn't that where Julia Anne worked? I'm surprised more of our classmates have not commented on this picture. I remember being born there (not really) and I remember my smallpox shot (distinctly). Remember those? There is a structure there now and I do believe its named the Ellen Fitzgerald Senior Center but I'm not certain if it's the original structure. Now, that you have properly identified this aerial photograph as the Ellen Fitzgerald Memorial Hospital - I'll sub-title the post and move on to "TEST YOUR AERIAL SKILLS (Level 2). If you know the answers - don't be shy. SHOUT IT OUT! And, even if you don't know the answers - JOIN IN! The senior center is a new building. Julia Anne took me on a tour several years ago and I was amazed at it and what all goes on there. Julia Anne is still the director as far as I know, and she is doing an excellent job! Do go by and check the place out; I know Julia Anne would be happy to see you all! When I was younger, I started out my "Candy Striping' at the Ellen Fitzgerald Hospital when it was a nursing home facility. I enjoyed going there and got a lot of hours in helping out. There was no air conditioning or luxuries either...just a lot of personal rewards. My mother was also a patient at the hospital on several occasions. She had several heart attacks before I ever went to school and would be at the hospital for long periods of time. My dad would take Bobby and me to the hospital so we could look in the window of mother's room to see her...No children were allowed in the hospital unless they were sick. I was a photographer in high school. I did many of the annual pictures. I also did aerial photos for customers. On the right lower corner next to putt-putt golf course was a restaurant. What was name of restaurant? I'm actually glad now I'm in the midst of a sleepless night - I get to be the first one to welcome you here. I'm fairly certain you're referring to the Bonfire Restaurant. I remember being invited there for a Woolworth's Christmas party (probably Christmas 1962?). Thanks for sharing all the great pictures - just AWESOME! PS: Hope you don't hold it against me but I went over and read Nita's July 2004 article to get the name of that restaurant. Otherwise, I would've been up all night. Ain't she great? Wasn't the Bonfire Restaurant further east toward Hilltop? Glad to see your Comment pop up, John Gulledge.......after enjoying all your photos that have been posted. Many thanks for helping to make our memories come to life, seeing things "from the old days" again. So many of us just didn't have cameras or many family photos from our earliest years. I look forward to your adding some more bits of info to some of those photos already posted! Mary Faith is right - the Bonfire was across Morgan Mill Road and farther to the right from the Putt-Putt golf. This one has me stumped. Okay, John...I'll bite. Was it Keziah's? ?